How many squares can you count in this window? I recently designed and created this stained glass window in gorgeous color, and my brainy colleagues always give different answers! Show this to friends, as no two friends will give you the same answer -- and this is precisely why the puzzle plays with our perception of consensus reality. How many squares did you find? Post your answers here. Let's see how well your friends can do on this puzzle. If you are a teacher, how many squares can your students find? How can our perceptual systems be so different? How does the number of perceived squares depend on a person's age, gender, occupation, emotional state, IQ, caffeine level, and culture? Hint: there are no "tricks" here. This is a puzzle that does not require millimeter measurements. You can see the squares "by eye." 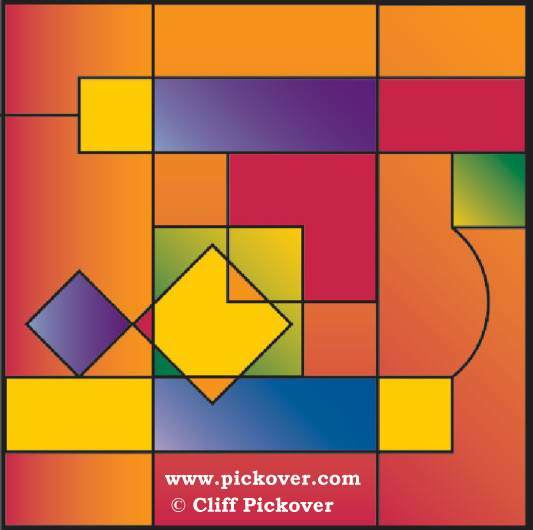 If you like puzzles like these, see my mathematical puzzle books.